In the 150 years since Darwin, evolutionary biology has proven as essential as it is controversial, a critical concept for answering questions about everything from the genetic code and the structure of cells to the reproduction, development, and migration of animal and plant life. But today, as David P. Mindell makes undeniably clear in The Evolving World, evolutionary biology is much more than an explanatory concept. It is indispensable to the world we live in. This book provides the first truly accessible and balanced account of how evolution has become a tool with applications that are thoroughly integrated, and deeply useful, in our everyday lives and our societies, often in ways that we do not realize. 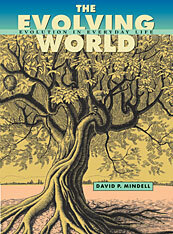 When we domesticate wild species for agriculture or companionship; when we manage our exposure to pathogens and prevent or control epidemics; when we foster the diversity of species and safeguard the functioning of ecosystems: in each of these cases, Mindell shows us, evolutionary biology applies. It is at work when we recognize that humans represent a single evolutionary family with variant cultures but shared biological capabilities and motivations. And last but not least, we see here how evolutionary biology comes into play when we use knowledge of evolution to pursue justice within the legal system and to promote further scientific discovery through education and academic research. More than revealing evolution’s everyday uses and value, The Evolving World demonstrates the excitement inherent in its applications—and convinces us as never before that evolutionary biology has become absolutely necessary for human existence.